Large acetabular defects and pelvic discontinuity represent complex problems in revision total hip arthroplasty. This study aimed to investigate whether reconstruction with the Ganz reinforcement ring would provide durable function in large acetabular defects. 46 hips (45 patients, 19 male, 26 female, mean age 68 years) with AAOS type III and IV defects undergoing acetabular revision with the Ganz reinforcement ring were evaluated at a mean follow-up of 74 months (24–161 months). Fourteen patients died during follow-up. All surviving patients were available for clinical assessment and radiographic studies. Radiographs were evaluated for bone healing and component loosening. A Cox-regression model was performed to identify factors influencing survival of the Ganz-ring. 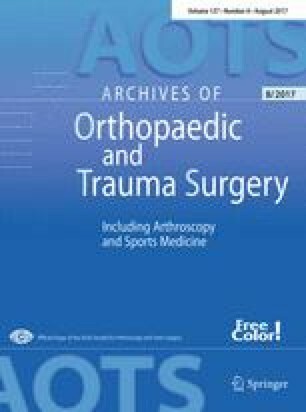 In the group of AAOS III defects, 3 of 26 acetabular reconstructions failed, all due to aseptic loosening. In pelvic discontinuity (AAOS IV), 9 of 20 hips failed due to aseptic loosening (n = 4), deep infection (n = 3), and non-union of the pelvic ring (n = 2). With acetabular revision for any reason as an endpoint, the estimated Kaplan–Meier 5-year survival was 86% in type III defects and 57% in type IV defects, respectively. The presence of pelvic discontinuity was identified as the only independent predictive factor for failure of the Ganz ring acetabular reconstruction (AAOS III vs. IV, Hazard ratio: 0.217, 95%, Confidence interval: 0.054–0.880, p = 0.032). The Ganz reinforcement ring remains a favorable implant for combined segmental and cavitary defects. However, defects with pelvic discontinuity demonstrate high failure rates. The indications should therefore be narrowed to acetabular defects not associated with pelvic discontinuity. Cynthia Hourscht and Mohammad K. Abdelnasser contributed equally to this manuscript. A correction to this article is available online at https://doi.org/10.1007/s00402-018-3101-z.